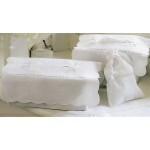 Exquisitely pretty oblong and boutique tissue box covers white lace, embroidered lily of the valley, lavender or white floral motif's. 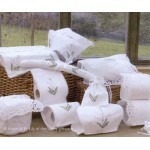 with a range of matching accessories including coat hanger sets, lavender bags, toilet roll holders, laundry bags, cushion covers and doilies. 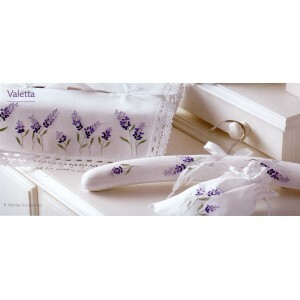 They make wonderful inexpensive gifts. 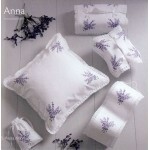 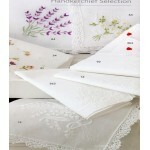 Anna lavender sprig embroidered tissue box cover ..
Hand made white Cluny lace 100% cotton. 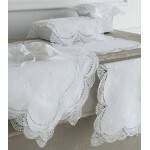 place mat Size: 30cm x 45cm ..
High quality 100% cotton lace and embroidered handkerchieves, delicately feminine and a lovely gi..
Lily of the Valley embroidered tissue box cover &..
Loire waffle effect embroidered tissue box cover ..
Lace boutique tissue box cover in White. 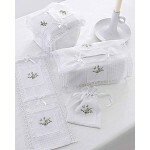 Simple yet sophisticated, this Sligo lace collection..
Wicklow lucky Shamrock embroidered tissue box cover &nbs..